Grapevine magazine has been around for 20 years, helping people to find out what is happening in our area. The first issue appeared in October 1994. This is what was written in their first editorial. 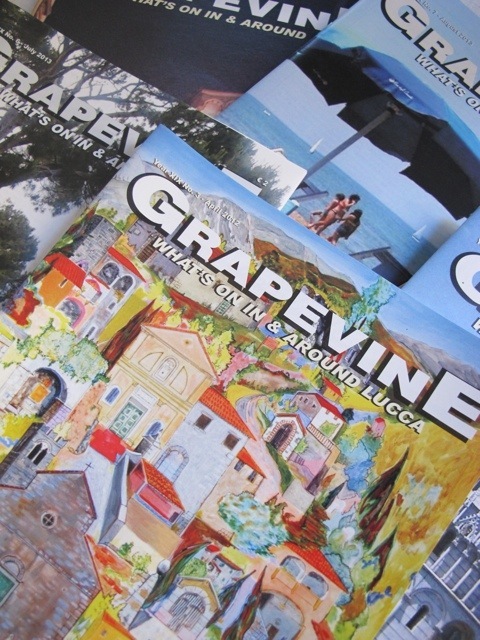 “This is the first issue of GRAPEVINE, a monthly guide in English to what’s on in Lucca and the surrounding area. There is a lot going on in this area but finding out about it is not always easy and can depend on picking up a leaflet by chance in a hotel reception area or spotting a poster in town. Now the visitor to Lucca can find information collected together as never before. GRAPEVINE is not just a list of events and activities. The articles reflect many different aspects of local life and news and are not limited just to items of traditional tourist interest. 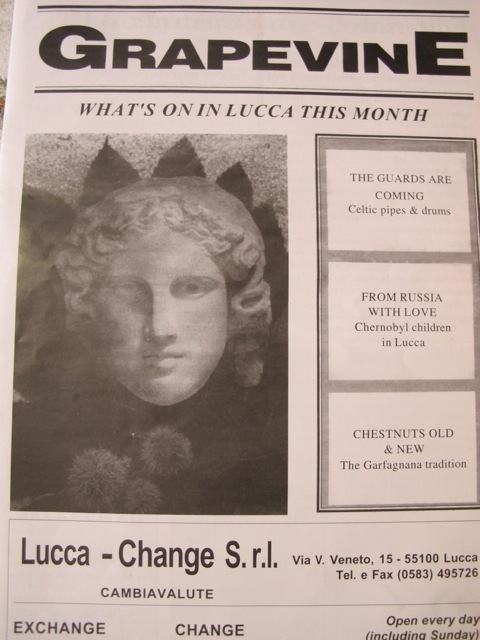 I have found the magazine very useful in the 10 years I have been coming to Bagni di Lucca, and still have most of the copies I have bought over the years. It is a great way to keep up with local activities. Look out for the magazine in local newsagents and you can also sign up to read Grapevine on line. Congratulations on the first 20 years…may there be many more. This entry was posted in Things to see and do and tagged Bagni di Lucca, Grapevine, local news, Lucca, travel by Debra Kolkka. Bookmark the permalink. It is a great publication and I wish them to continue -at least for another 20 years. It is a great way to keep up with local happenings. Grapevine is the first thing I buy after we arrive in Bagni di Lucca. I too have kept my copies over the years. Good to know it can now be seen online. Congratulations on the first twenty years of a very attractive and useful publication. When I first came the magazine was very helpful for finding things in the area. Now that I am settled it is still great to keep up with things. Congratulations to the Grapevine. We found it very informative and may it continue for many years to come.